Statistics is more important than ever before because we have more meaningful opportunities to make use of data. 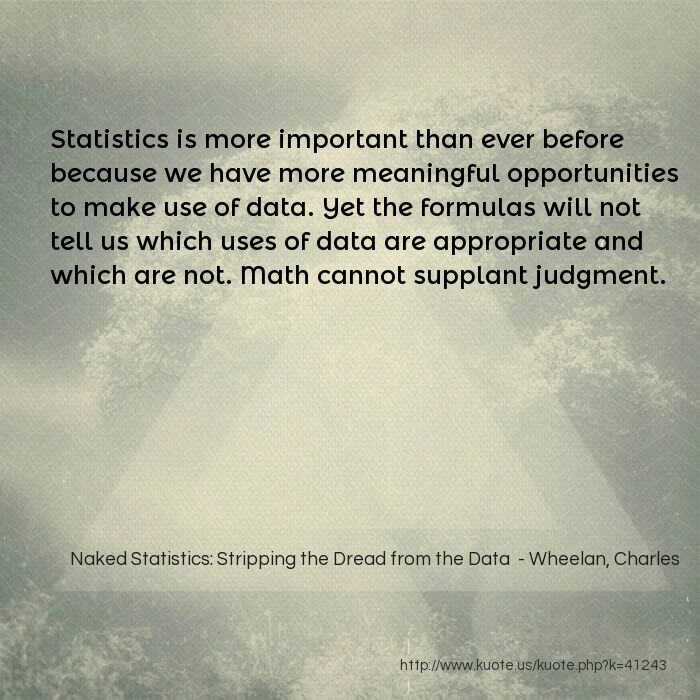 Yet the formulas will not tell us which uses of data are appropriate and which are not. Math cannot supplant judgment. 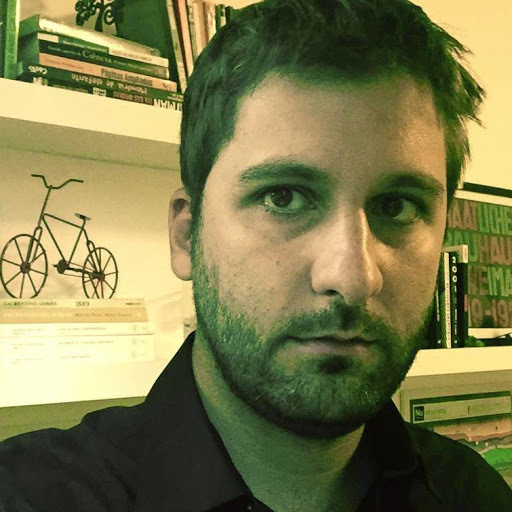 Duflo was awarded the John Bates Clark Medal. This prize is presented by the American Economic Association to the best economist under the age of forty. * Among economist geeks, this prize is considered to be more prestigious than the Nobel Prize in Economics because it was historically awarded only every two years. 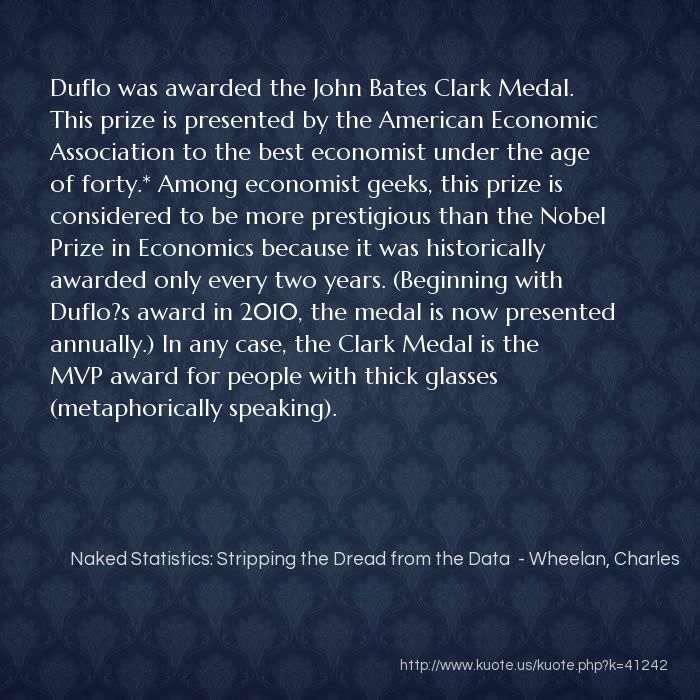 (Beginning with Duflo?s award in 2010, the medal is now presented annually.) In any case, the Clark Medal is the MVP award for people with thick glasses (metaphorically speaking). 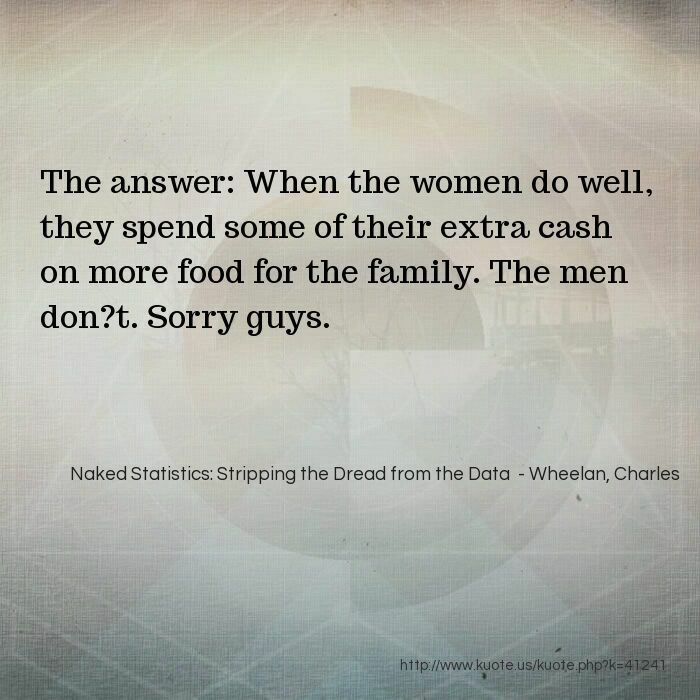 The answer: When the women do well, they spend some of their extra cash on more food for the family. The men don?t. Sorry guys. But hold on. Let?s not fire anybody yet. The Air Force Academy study had another relevant finding?about student performance over a longer horizon. 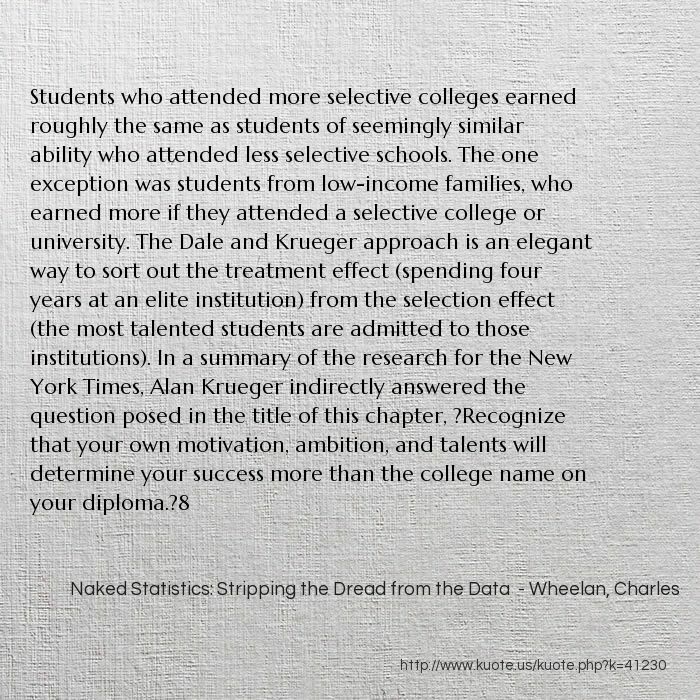 Carrell and West found that in math and science the students who had more experienced (and more highly credentialed) instructors in the introductory courses do better in their mandatory follow-on courses than students who had less experienced professors in the introductory courses. One logical interpretation is that less experienced instructors are more likely to ?teach to the test? in the introductory course. 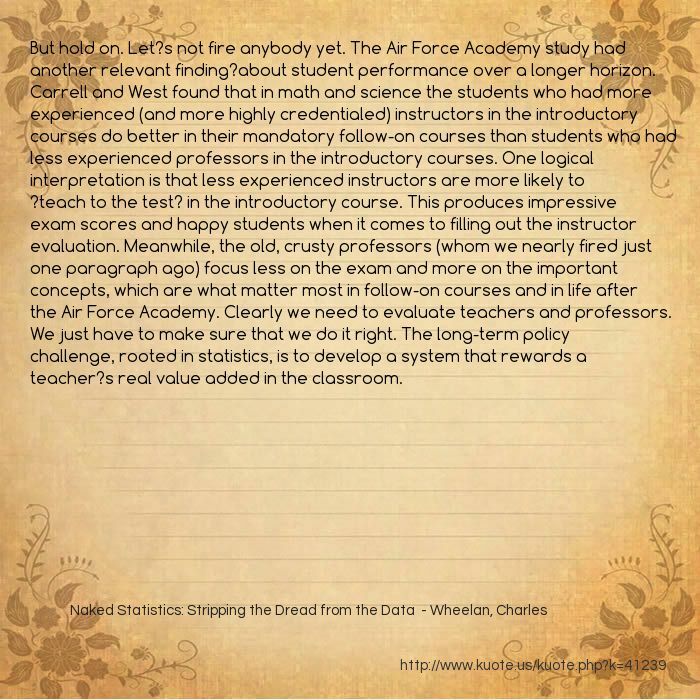 This produces impressive exam scores and happy students when it comes to filling out the instructor evaluation. Meanwhile, the old, crusty professors (whom we nearly fired just one paragraph ago) focus less on the exam and more on the important concepts, which are what matter most in follow-on courses and in life after the Air Force Academy. Clearly we need to evaluate teachers and professors. We just have to make sure that we do it right. The long-term policy challenge, rooted in statistics, is to develop a system that rewards a teacher?s real value added in the classroom. Scott Carrell and James West, professors at the University of California at Davis and the Air Force Academy, exploited this elegant arrangement to answer one of the most important questions in higher education: Which professors are most effective?15 The answer: The professors with less experience and fewer degrees from fancy universities. 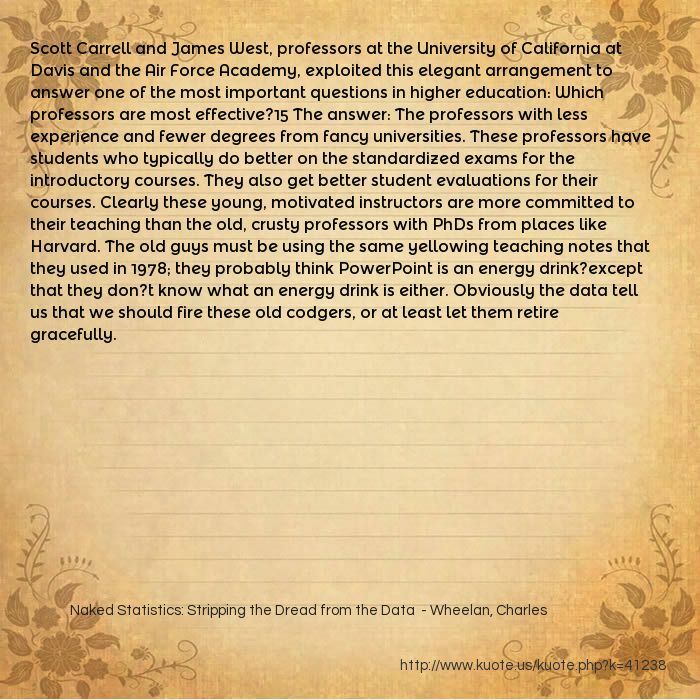 These professors have students who typically do better on the standardized exams for the introductory courses. They also get better student evaluations for their courses. Clearly these young, motivated instructors are more committed to their teaching than the old, crusty professors with PhDs from places like Harvard. The old guys must be using the same yellowing teaching notes that they used in 1978; they probably think PowerPoint is an energy drink?except that they don?t know what an energy drink is either. Obviously the data tell us that we should fire these old codgers, or at least let them retire gracefully. the case of the New York City teacher ratings, principals in the system had been prepped on the appropriate use of the value-added data and the inherent limitations. The public did not get that briefing. As a result, the teacher assessments are too often viewed as a definitive guide to the ?good? and ?bad? teachers. We like rankings?just think U.S. News & World Report college rankings?even when the data do not support such precision. Test scores give us an objective measure of student performance. Yet we know that some students will do much better on standardized tests than others for reasons that have nothing to do with what is going on inside a classroom or a school. 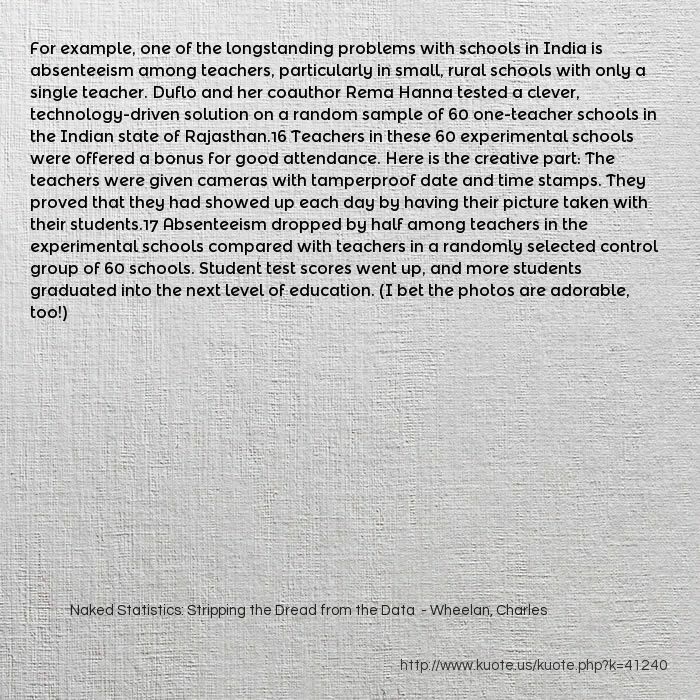 The seemingly simple solution is to evaluate schools and teachers on the basis of the progress that their students make over some period of time. What did students know when they started in a certain classroom with a particular teacher? What did they know a year later? The difference is the ?value added? in that classroom. 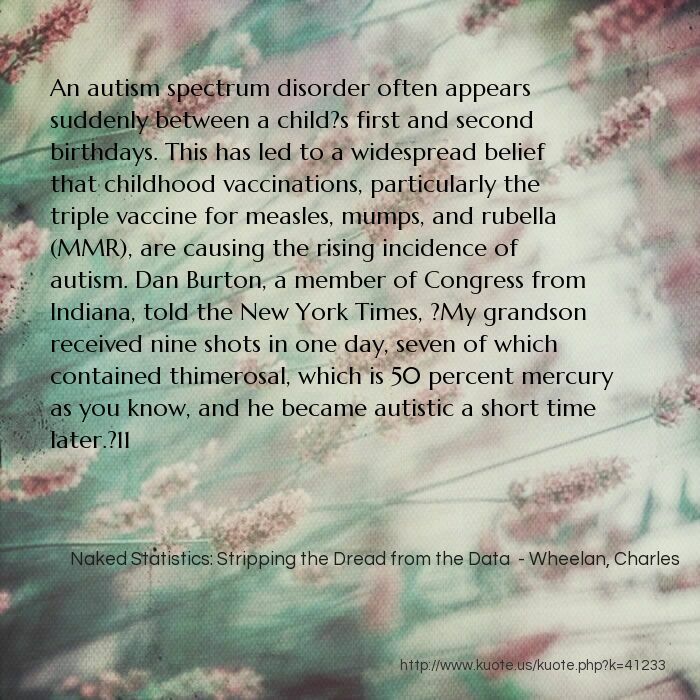 Autism rates did not decline when thimerosal was removed from the MMR vaccine, nor are autism rates lower in countries that never used this vaccine. Nonetheless, the false connection persists, which has caused some parents to refuse to vaccinate their children. 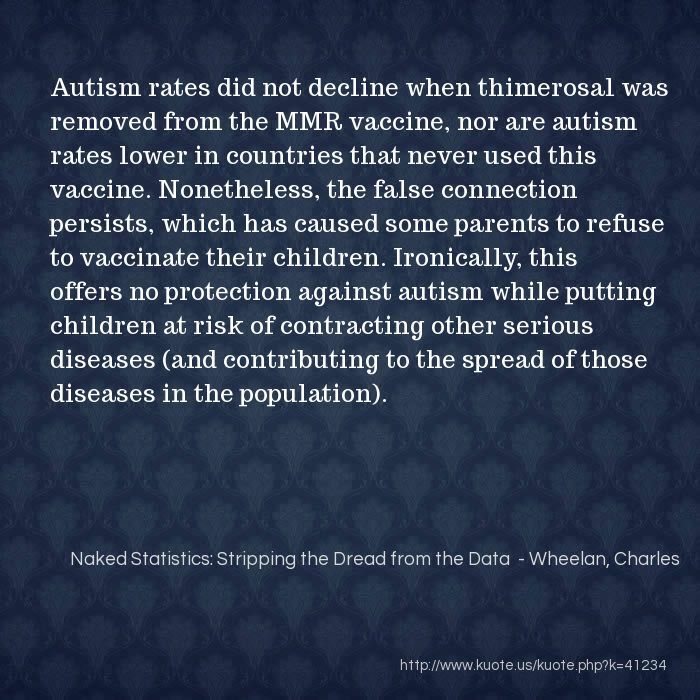 Ironically, this offers no protection against autism while putting children at risk of contracting other serious diseases (and contributing to the spread of those diseases in the population). As usual, a simple comparison between the students who attend summer school and those who do not would be worse than useless. The students who attend summer school are there because they are struggling. Even if the summer school program is highly effective, the participating students will probably still do worse in the long run than the students who were not required to take summer school. What we want to know is how the struggling students perform after taking summer school compared with how they would have done if they had not taken summer school. 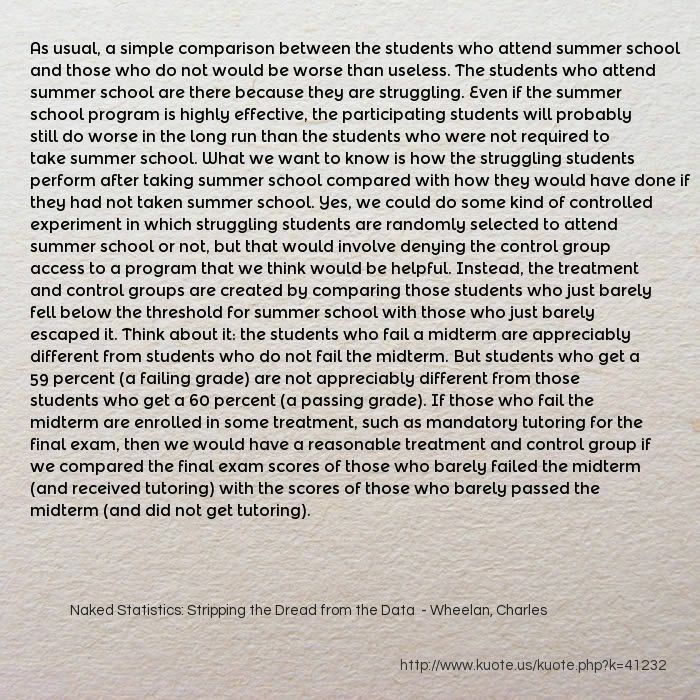 Yes, we could do some kind of controlled experiment in which struggling students are randomly selected to attend summer school or not, but that would involve denying the control group access to a program that we think would be helpful. Instead, the treatment and control groups are created by comparing those students who just barely fell below the threshold for summer school with those who just barely escaped it. Think about it: the students who fail a midterm are appreciably different from students who do not fail the midterm. But students who get a 59 percent (a failing grade) are not appreciably different from those students who get a 60 percent (a passing grade). If those who fail the midterm are enrolled in some treatment, such as mandatory tutoring for the final exam, then we would have a reasonable treatment and control group if we compared the final exam scores of those who barely failed the midterm (and received tutoring) with the scores of those who barely passed the midterm (and did not get tutoring). Whatever happened after the tax cut cannot be attributed solely to the tax cut. The challenge with any ?before and after? 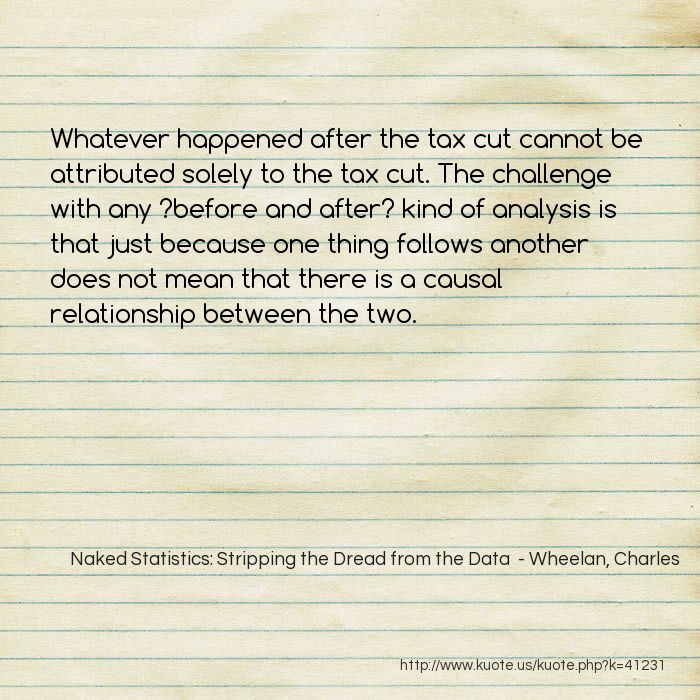 kind of analysis is that just because one thing follows another does not mean that there is a causal relationship between the two. 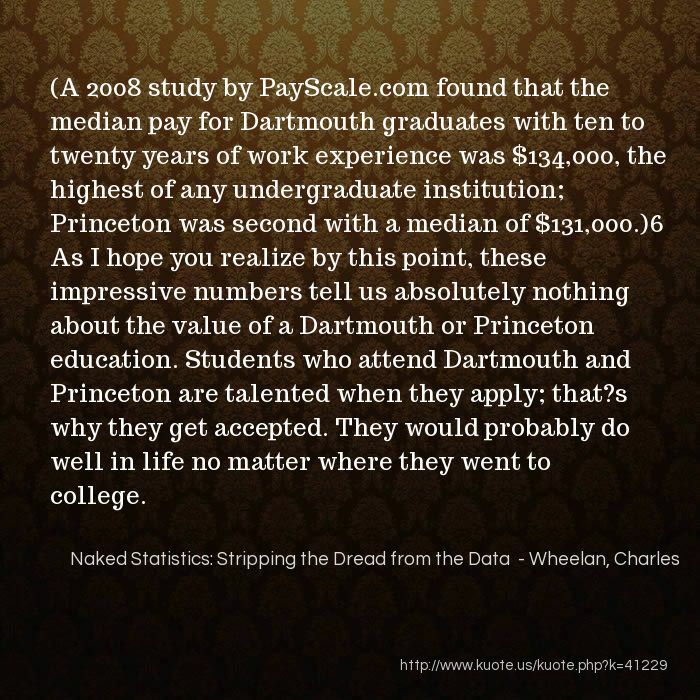 (A 2008 study by PayScale.com found that the median pay for Dartmouth graduates with ten to twenty years of work experience was $134,000, the highest of any undergraduate institution; Princeton was second with a median of $131,000. )6 As I hope you realize by this point, these impressive numbers tell us absolutely nothing about the value of a Dartmouth or Princeton education. Students who attend Dartmouth and Princeton are talented when they apply; that?s why they get accepted. They would probably do well in life no matter where they went to college. 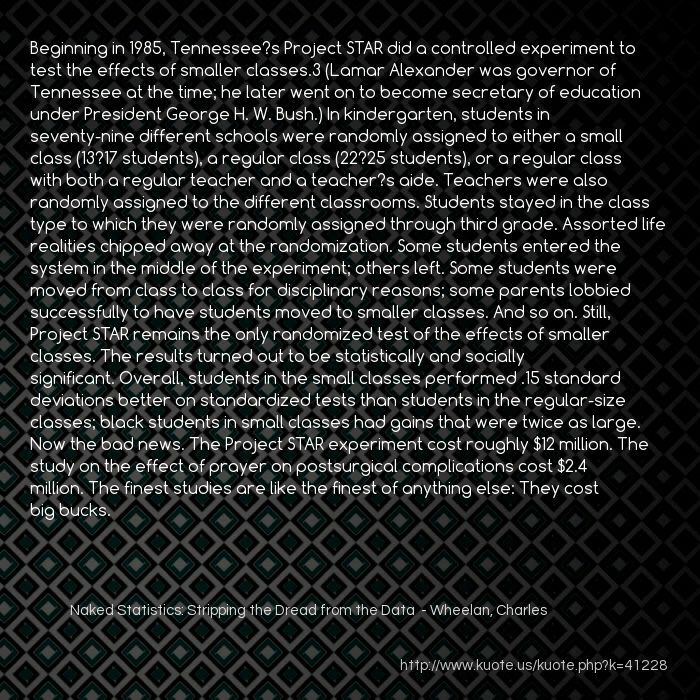 Beginning in 1985, Tennessee?s Project STAR did a controlled experiment to test the effects of smaller classes.3 (Lamar Alexander was governor of Tennessee at the time; he later went on to become secretary of education under President George H. W. Bush.) In kindergarten, students in seventy-nine different schools were randomly assigned to either a small class (13?17 students), a regular class (22?25 students), or a regular class with both a regular teacher and a teacher?s aide. Teachers were also randomly assigned to the different classrooms. Students stayed in the class type to which they were randomly assigned through third grade. Assorted life realities chipped away at the randomization. Some students entered the system in the middle of the experiment; others left. Some students were moved from class to class for disciplinary reasons; some parents lobbied successfully to have students moved to smaller classes. And so on. Still, Project STAR remains the only randomized test of the effects of smaller classes. The results turned out to be statistically and socially significant. Overall, students in the small classes performed .15 standard deviations better on standardized tests than students in the regular-size classes; black students in small classes had gains that were twice as large. Now the bad news. The Project STAR experiment cost roughly $12 million. The study on the effect of prayer on postsurgical complications cost $2.4 million. The finest studies are like the finest of anything else: They cost big bucks. Here is how Jonathan Klick and Alexander Tabarrok, researchers at the University of Pennsylvania and George Mason University, respectively, studied how putting more police officers on the street affects the crime rate. Their research strategy made use of the terrorism alert system. Specifically, Washington, D.C., responds to ?high alert? days for terrorism by putting more officers in certain areas of the city, since the capital is a natural terrorism target. We can assume that there is no relationship between street crime and the terrorism threat, so this boost in the D.C. police presence is unrelated to the conventional crime rate, or ?exogenous.? The researchers? 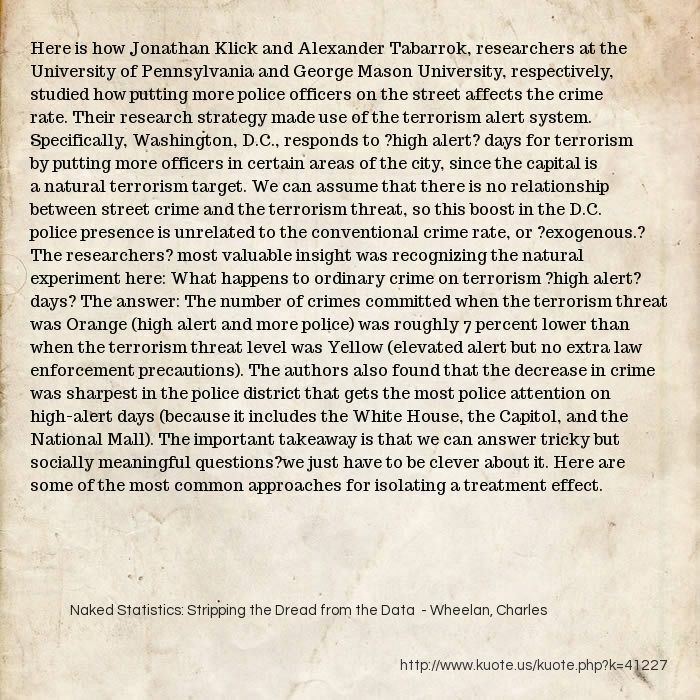 most valuable insight was recognizing the natural experiment here: What happens to ordinary crime on terrorism ?high alert? days? The answer: The number of crimes committed when the terrorism threat was Orange (high alert and more police) was roughly 7 percent lower than when the terrorism threat level was Yellow (elevated alert but no extra law enforcement precautions). The authors also found that the decrease in crime was sharpest in the police district that gets the most police attention on high-alert days (because it includes the White House, the Capitol, and the National Mall). The important takeaway is that we can answer tricky but socially meaningful questions?we just have to be clever about it. Here are some of the most common approaches for isolating a treatment effect. John Ioannidis, a Greek doctor and epidemiologist, examined forty-nine studies published in three prominent medical journals.8 Each study had been cited in the medical literature at least a thousand times. Yet roughly one-third of the research was subsequently refuted by later work. (For example, some of the studies he examined promoted estrogen replacement therapy.) 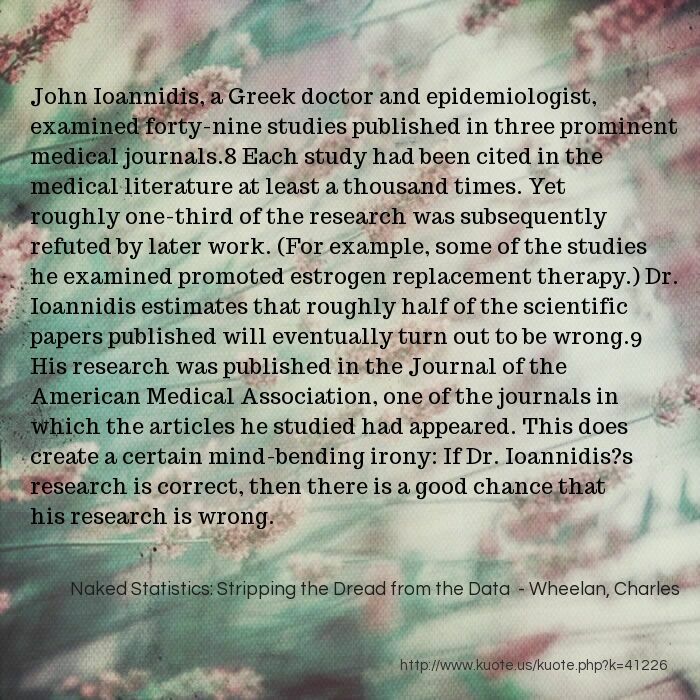 Dr. Ioannidis estimates that roughly half of the scientific papers published will eventually turn out to be wrong.9 His research was published in the Journal of the American Medical Association, one of the journals in which the articles he studied had appeared. This does create a certain mind-bending irony: If Dr. Ioannidis?s research is correct, then there is a good chance that his research is wrong. 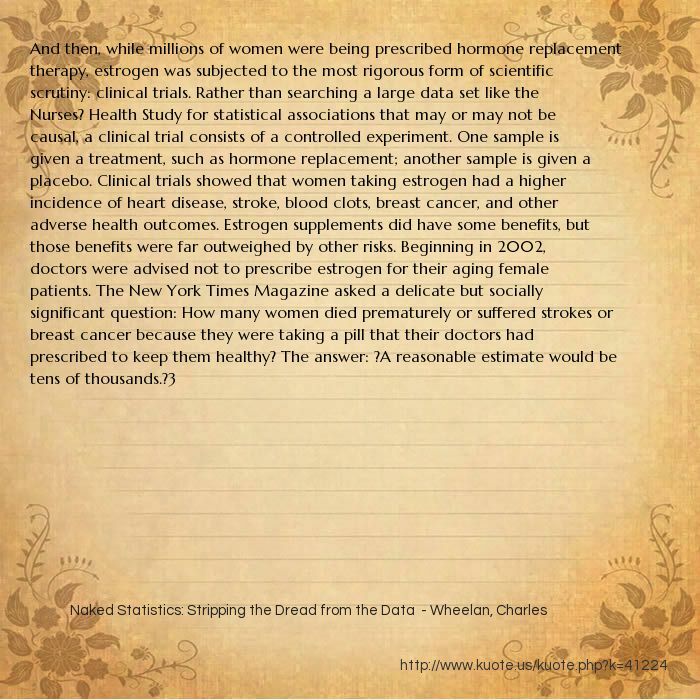 Even the results of clinical trials, which are usually randomized experiments and therefore the gold standard of medical research, should be viewed with some skepticism. In 2011, the Wall Street Journal ran a front-page story on what it described as one of the ?dirty little secrets? of medical research: ?Most results, including those that appear in top-flight peer-reviewed journals, can?t be reproduced. ?7 (A peer-reviewed journal is a publication in which studies and articles are reviewed for methodological soundness by other experts in the same field before being approved for publication; such publications are considered to be the gatekeepers for academic research.) One reason for this ?dirty little secret? 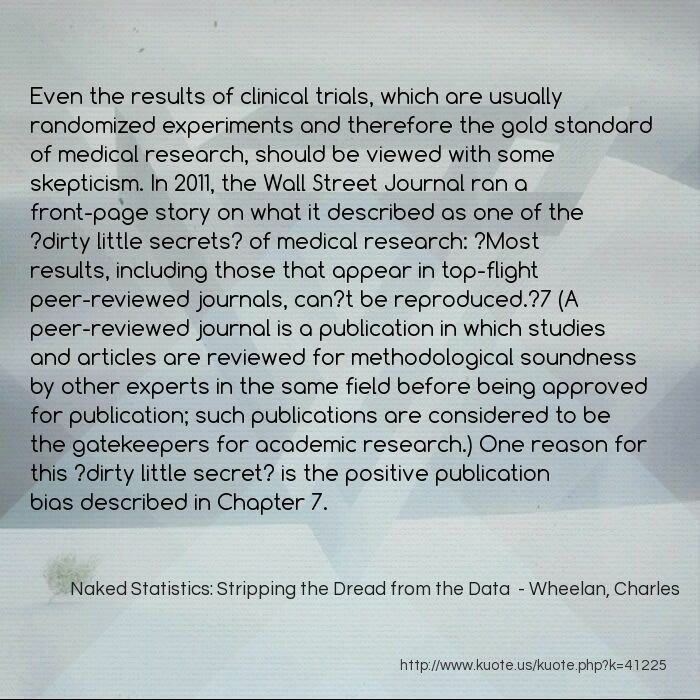 is the positive publication bias described in Chapter 7.